Below you will find a list of our vacation rentals that are accessible by motorcycle. Cruise into the perfect cabin in the woods, equipped with a variety of great amenities from hot tubs to game tables. Enjoy the quiet and privacy in a cabin with great views, thoughtful interior design, and plenty of nearby activities. 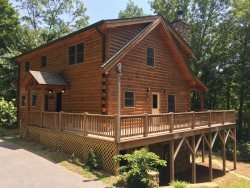 We have a diverse collection of vacation cabin rentals, waiting to provide you with the most relaxing getaway. With access to hiking, rafting, fishing, zip lining, and more - you are sure to find memorable entertainment. Some cabins are even pet-friendly! Deer Run Meadow - Large comfortable cabin with beautiful open meadow.